Want to get yourself a trendy under cut or even your regular trim? Want to find out a salon that will take care of your beloved beard? Then you need to bookmark these men's salons across budgets from around the city. A regular barber for most Christ and JNC students that flock to Tulips to get their haircut, you can also get one here for INR 130, which includes a shampoo and conditioning as well. Don’t expect anything fancy, but you will surely get a good haircut without any of the expensive products and serums. A facial and haircut combo here will cost you INR 480, which you could splurge on once a month. You also get discounts by showing your college ID. The world’s oldest men’s salon, Truefitt and Hill is in Bangalore and going here will put you in fine company with clientele such as Winston Churchill, Charles Dickens and Frank Sinatra. But all of this comes at a cost. The prices are quite steep and the Classic Haircut (hair cleansing and moisturising followed by a haircut) starts at around INR 1,500 and upwards. So if you wish to be among royalty, head to their Lavelle Road, Indiranagar, or Whitefield outlets for some royal treatment, guys! The Touch Of Class salon on Cunningham Road has services for men and women and is a convenient parlour located in the middle of the city, easily accessible. For men, they have services including haircuts, pedicure and manicure, head massage and shampoo and conditioning. A haircut for men costs around INR 300, which is a budget amount these days. Jawed Habib Hair and Beauty Salon has lots of branches across India and good news, Bangalore has its fair share of salons as well. There are six salons in Kalyan Nagar and they have all facilities including haircut, shaving and other men’s grooming services. Included in their services are hair colouring, manicure, pedicure and haircuts. It is moderately priced, at INR 300 for a haircut, a special rate introduced for a few months now. Apart from this, you can avail massage services along with your haircut as well. VLCC is not just a salon but a bundle of everything. They have grooming services for men including haircut, shave, streaking and trimming. Hair spas, which treat your hair in different ways are all available for men and whatever problem you might have, VLCC have a solution for you. A haircut with wash will cost you around INR 299, and you can do so much more at VLCC than just get a haircut. They also have other services including healthcare services, spa services and also have a load of wellness products. The Moustache Barbershop is an old-fashioned salon, which aims at bringing back the salons of the old times, where men can go and chill, hang out and get haircuts at the same time. Seems like that was quite a while ago, huh? The HSR Layout barbershop, as they call it, is a man cave, and has all the services that a man needs to look dapper, including haircuts, shave, trims and massages. A haircut with a wash costs INR 250, which is a steal. Limelite is a unisex salon that has been around in the city for a while now, and we’ve all gone there at least once for a haircut. They have a huge number of services for women, but men can also get a haircut done here, which is for INR 180, and if you get a membership you can get it for INR 150! LimeLite is located in a few places across the city. 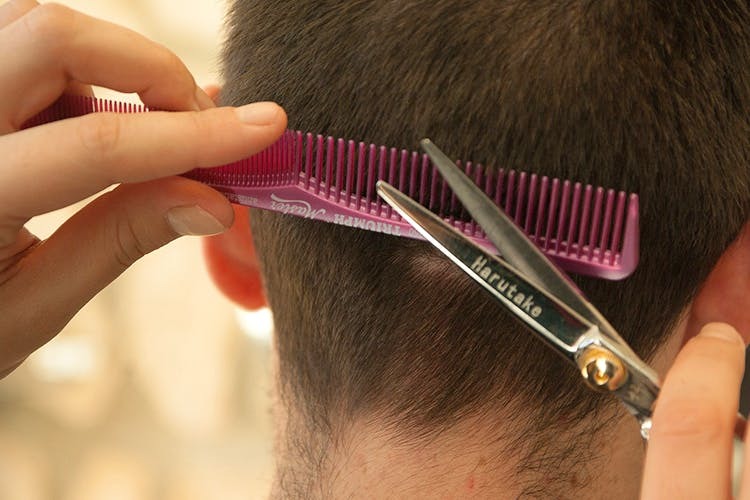 For men, they have services such as haircut, hair colouring, hair spa (treatment for your hair if there is a problem, including hair fall or dandruff), massages, manicure, pedicure and even a facial. Green Trends is another unisex salon in the city that has services for men including styling, bleaching and detan, hair coloring, manicures and pedicures. A haircut here is INR 200, but if you have a membership, then you are entitled to some price deals and offers on services availed. The basic haircut includes the cut, shampoo, conditioning and blow dry. So that seems like a good deal to us. Green Trends is also spread over the city, so you should have no problems locating one.